Whenever I walk into an ice cream shop, I invariably leave with the flavor that's managed to cram the largest amount of chocolate into the smallest amount of space. With the exception of that rare occasion when I can find durian ice cream, I never order fruit flavors. Why order fruit when chocolate is so enticing? 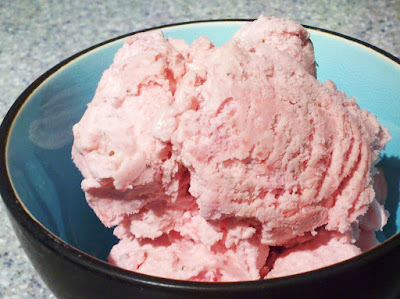 In fact, if you'd asked me a year ago, I'd have told you that I didn't like strawberry ice cream at all. And then I was introduced to Nice Cream, a local, artisan ice cream company that was featuring an incredible pairing of strawberry ice cream with pound cake. And then I made this recipe by request of my roommate, who loves strawberry ice cream and isn't exactly a fan of chocolate (sacrilege!). I was sold. This was the first ice cream I ever made, and it's still the one I make most frequently. Even though it makes a generous amount, I've found that it's only enough to satisfy 3-4 people. It's just that good. Trim the strawberries. Place strawberries, sugar, lemon juice, and salt into a blender. Pulse the blender on chop mode until the mixture reaches a chunky, mashed consistency (this will only take a few chops). Let this sit for 10 minutes. Transfer half of the strawberry mixture to a large bowl. Add cream to the remainder in the blender and puree until smooth. Combine the strawberry cream with the mashed mixture in the bowl, mixing until there are no streaks. Cover and chill for 5-6 hours. Freeze the mixture in an ice cream maker. (Note: follow the directions for your ice cream maker - mine, for example, requires the bowls to be left in the freezer for at least 24 hours before being used.) At this point, the ice cream will have the texture of soft serve. For firmer ice cream (my recommendation), transfer to an airtight container and freeze for 2 hours. Makes 1 1/2 quarts.